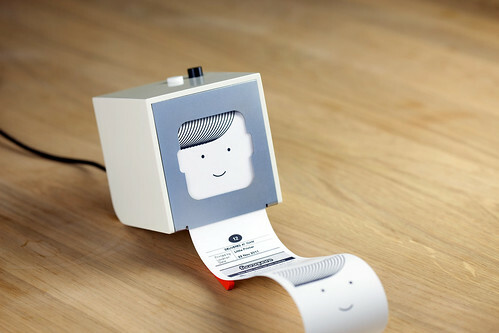 BERG's Little Printer looks lovely. I haven't held or used it yet but it looks as if a gigantic amount of work has gone into it, and much into the invisible network/services bit - they are trying to build many layers at once. Rev Dan Catt gets at why it's interesting: "Placing a small, cute, whimsical, standalone modern printer into a living room or kitchen will change behaviour (slightly) and invite new uses." And Matt Webb: "We wanted to create a beautiful product that has a different place in your life than "printing." Something able to do work for you, and to bring unexpected delight. The response on the internet has been interestingly polarised - love/hate is generally a good thing. People may be accustomed to think of print and paper (and to a certain extent printers) as discardable ephemera, which affects perceived value. People may be accustomed to think of printing as performing a very utilitarian role, and from that perspective LP might seem like a poorly-featured utility. People may expect that something positioned as fun, small and contenty should be cheap - ie the LP object and its price are signalling confusingly different things. We discount the value of new products until they're in our hands and we see the surprising uses they're put to. Particularly so the value of their intangible, networked, third-party capabilities. During the pre-order period much of that value isn't yet sufficiently shelf-demonstrable - such is the pain of bootstrapping. Looking at the Little Printer, I feel a little bit like I do about the cats and Ada's toys - I want to pick it up and give it a cuddle. I do not feel that way about our Samsung MNL-2855ND laser printer in the office. A different thing, in a different place, used differently. I hope BERG will do a Little Eye sibling. Immediately I think of making publications. Small surprises and hellos to Ada. A daily ticket that says REMEMBER YOU WILL DIE to help keep me focused. A story about receipts. I hope to enjoy the Little Printer as a beloved resource. I've written up our related thoughts in our weeknotes at http://gofreerange.com/week-187 (towards the bottom). I think it's easy for people to forget that it's often hard to understand what something is for until you can actually use it. It was even true for some of my colleagues - they didn't really *get* printing until they'd tried it themselves. Only time will tell how the public reacts to Little Printer, but I'm cautiously optimistic. It's like having your own printing press, newspaper and a dog to fetch it for you, all in your front room.